We are always keen to share information about other sources relating to the history of the Ulster Plantation which complement the Great Parchment Book, especially those which are available online. The UK National Archives holds a series of maps of Ireland in the 16th and early 17th centuries. Of the 68 maps depicting plantations, fortifications and townships in Ireland during the reigns of Elizabeth I and James I, more than 40 relate to Ulster in the years of the Plantation leading up to the formation of the Irish Society and the period covered by the Great Parchment Book. 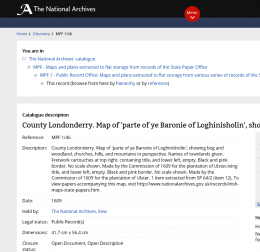 Discovery, TNA’s online catalogue, contains detailed descriptions of each map and a high resolution image is downloadable for a fee directly from the catalogue entry (example, MPF 1/46 County Londonderry. Map of ‘parte of ye Baronie of Loghinisholin’ 1609). The original maps may be viewed for free at TNA in Kew. For more information about the maps, including contextual information and details of other publications that explain their meaning and importance, please read TNA’s research guide Irish maps c1558-c1610. The maps come from state papers Ireland, the main record of government business in Ireland in the early modern period. They have been extracted from series SP 64, and are now held in MPF 1/35-102. Papers associated with the maps may be found amongst the State papers Ireland 1509-1782. 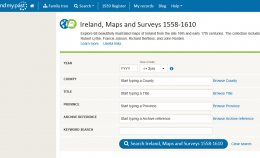 The maps have also been published online by Findmypast, a subscription based family history website, as Ireland, Maps and Surveys 1558-1610. The maps are searchable, but only by place, year and archive reference. This online resource has been covered at length in the Irish Examiner which reports that New collection quite literally maps the colonisation of Ireland 500 years ago. If you are especially interested in maps, you can read about livery company maps of the Londonderry Plantation in Dr Annaleigh Margey’s blog post here. For the period after the Great Parchment Book, you can find out more about Down’s Survey of Ireland, 1656-8 here. And search the Great Parchment Book blog for information about even more original sources, many of which are now accessible online, under History.